I found six deeds for my 2nd great-grandfather, Henry A. White (1824-1885) in the "Killingly, Connecticut Town Clerk Land Records, 1709-1907" digital microfilm at the Family History Library last February. 1) "A parcel in Killingly bounded Northerly on land of Samson Covell. Westerly on land of William Harrington and land of Otis Basto. Southerly on land of Arba Covell and land of Samson Covell. Easterly on lands of Calvin Cutler, Otis Basto, Arba Covell and containing by estimation fifty four acres be it the same more or less, with a dwelling house, Barn and other out-houses thereon standing. The said tract or parcel of land above described of which an undivided half is herein conveyed being the same and all the same land which was conveyed to my father Jonathan White by Joseph Arnold by deed bearing date the 9^th day of May AD 1837 to which reference may be had for a more particular description." In the first deed, Henry A. White sold the 54 acres of land to Plina Mitchell for $150 on 18 April 1851. In the second deed, Paulina Mitchell sold the land back to Henry A. White for $150 on 21 May 1852. The first deed included a proviso that the deed was null and void if Henry A. White paid Paulina the $150 with interest before two years passed. In the second deed, Mitchell quitclaims the deed back to Henry A. White because, apparently, he paid off the $150 he "borrowed" using this parcel of land as collateral. So, Henry A. White retained ownership of this parcel of land after 1852. 2) "...One certain tract or parcel of wood land situate and laying in the same town of Killingly and contains by estimation five & a half acres be it the same more or less and bounded as follows: Westerly on land of Dewlis Blois northerly on Otis Basto easterly on Arba Covell and southerly on land of Arba and Samson B. Covell and is the same lot of land which Reuben Robertson purchased of John Farrow by his deed dated the 7^th day of March A D 1808." In the third deed, Henry A. White sold this parcel of five and a half acres to his brother, Albert H. White for $12 on 12 April 1852. The land is probably near the land of the first two deeds since some of the neighbors are the same names. 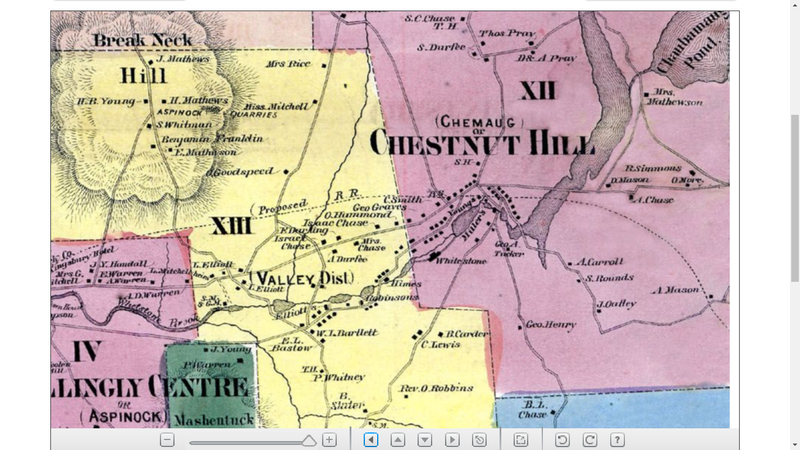 3) "one certain tract or parcel land situated in said Killingly bounded and described as follows viz. On the North by land formerly owned by Thomas S. Pierce and land belonging to the heirs of Reuben Bartlett deceased, East by land of Bernice Carder, southerly by land of Brayton Slater to the west side of a highway thence Southerly by the West side of said highway to land of Putnam Warren, Thence Westerly by said Warrens land and land belonging to the Widow and heirs of Joseph Pray deced containing about forty acres the same more or less together with a dwelling house and other building thereon standing said premises being subject to all legal highways passing over the same." In the fourth deed, Henry A. White sold this parcel of 40 acres to Almond M. Paine for $275 on 23 August 1855. The deed included the proviso that if Henry White paid the $275 with interest to Almond M. Paine within six months, then the deed was null and void. On 17 May 1856, Almond M. Paine acknowledged receiving the $275 debt due (although it was more than 6 months after the initial transaction). So Henry A. White again retained ownership of the parcel of land. In the fifth deed, Henry A. White sold this same parcel of 40 acres to Smith and Ellen Lewis of Killingly for $1,150 on 17 May 1856. In the sixth deed, Smith and Ellen Lewis sold the same parcel back to Henry A. White for $200 on 17 May 1856. The deed included the proviso that if Smith and Ellen Lewis paid the $200 with interest to Henry A. White within two years, then the deed was null and void. On 23 July 1857, Smith and Ellen Lewis paid the $200 to Henry A. White and this deed was cancelled. So Smith and Ellen Lewis retained ownership of this parcel of land. * May have been "cash poor" and needed the loan from Mitchell (deeds 1 and 2) and Paine (deed 3) to tide him over for periods of time. * He probably sold the 40 acre parcel (deeds 5 and 6) on 17 May 1856 to Smith and Ellen Lewis in order to pay off Paine, but had to carry a $200 mortgage for the Lewises, which was paid off within two years. The primary reason I have gone into all of this detail in the transcriptions and this blog post is to determine if I can identify where the Henry A. White land is located. I magnified the area of East Killingly where I think the land of the Deeds 4 through 6 was located, based on the names of the neighbors (Carder, Slater, Warren, Bartlett, Pray) and I think that the road mentioned in the deed goes southwest from the cluster of houses below "Chestnut Hill" into the yellow area. I see B. Carder, C. Lewis and B. Slater along that road, and Bartlett on the west side of the area. However, I cannot find a similar set of land owners for the parcel in Deeds 1 and 2 above yet. Granted, this is an 1869 map, and the deeds were in the 1850s. The different land parcels may have changed ownership in the intervening time. I need more information - perhaps there is a Killingly or Windham County history book that would help.